GMail’s user interface has got a big make over today and the new user interface is available to everyone. We can switch to the new user interface by click on “Switch to the new look” link available at the bottom right of GMail (If you are on IE 6 or similar type of bad browsers, you will not see the option!). I switched to the new user interface as soon I noticed the link and played with it for sometime. In this post I want to share the prominent features of all new GMail interface. Did you observe the above screenshot of conversations view? It has profile images of the participants in the thread. Identifying person of a thread is much more easy. Search is the heart of Google’s business and it’s their flagship technology. 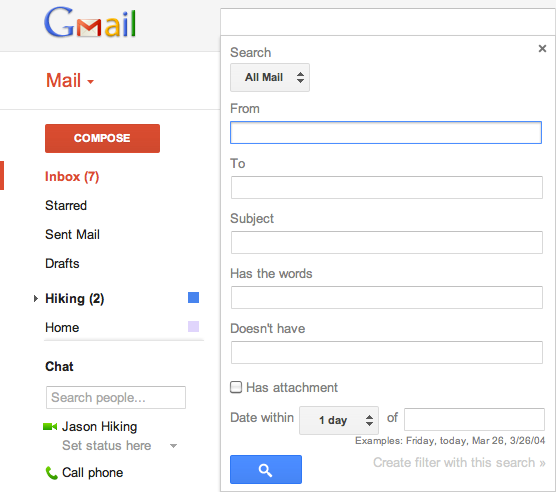 GMail’s search interface is enhanced to let you quickly find the required e-mails. Also you can create mail filters from the search box without leaving the screen or opening up a new popup. There is no doubt that this is post PC era where people started using more of tablets and big screen smartphones than ever. The new user interface of GMail automatically resizes itself to fit the size of screen seamlessly. Are you bored with minimalistic GMail interface and the few flashy themes? Here comes GMail HD themes backed by stock photographs sourced from iStockPhoto website. If you have a widescreen HD monitor then decorate your inbox with beautiful themes. Now you got a splitter between Labels & Chat panel that lets resize their height as you prefer. Also Label panel auto expands its height when you mouse over to show you hidden labels if any.